Johnson and Wales University appears in our ranking of the 5 Best Online Schools for a Bachelor’s Degree in Entertainment Management. Students who want to study hospitality at Johnson and Wales University will enroll in programs offered by the College of Hospitality Management or the Master of Business Administration program with an emphasis in Hospitality. The College of Hospitality offers a diverse selection of degree options with emphases available in Hospitality Management, Hotel & Lodging Management, and Tourism & Hospitality Management. Students can also major in Sports, Entertainment, Event – Management, Restaurant, Food & Beverage Management, and Culinary Arts & Food Service Management. The university also offers a graduate program with its Master of Science in Global Tourism and Sustainable Economic Development. These programs are offered in Providence, Miami, Charlotte, and Denver, as well as through the College of Online Education. Within the university’s programs in hospitality, students will learn to communicate to diverse audiences the needs of a hospitality operation, as well as learn how to solve common problems that facilities and organizations face in the hospitality 8industry. Students will also study the trends guiding modern hospitality, as well as learn effective management techniques. “CEOWORLD Magazine” rated the hospitality programs at Johnson and Wales University in the top 15 in the world in their 2018 list. The Bachelor of Science in Hospitality is one of the programs at Johnson and Wales University that requires that students have some full-time work experience after exiting high school. To qualify for admission, students must have at least two years of post-high school work experience. The hospitality degree also doesn’t require that students attend any classes on campus, as the entire degree may be earned through online study. Classes a student may take while studying hospitality include Managing the Hotel Guest Experience, Technology in the Tourism/Hospitality Industry, and Hospitality Sales and Meeting Management. Other classes include Sustainable Hotel Support Operations, Private Club Management, International Hotel Development and Hospitality Security and Risk Management. Students may augment their degree with electives in related areas like the culinary arts, sport management, tourism, and sustainability. Students who enroll in the Master of Business Administration program will study topics like operations management, hospitality law, human resources, and strategic marketing. Students will take classes in four terms of 11 weeks each. The MBA in Hospitality is offered online, so students from anywhere can enroll in the program. Students can bypass the GMAT requirement when they apply to the MBA program when they have an undergraduate GPA of at least 2.85 on a 4.00 scale. Johnson and Wales University is a private, nonprofit institution in Providence, Rhode Island. The university is styled as a career-oriented school with popular programs in business, the culinary arts, engineering, hospitality, and other areas. Founded in 1914, the university has more than 15,000 students attending classes in Rhode Island, as well as at its other campuses in North Carolina, Florida, and Colorado. The main campus in Providence covers 176 acres, and the university’s official colors are white and blue. Students who participate in sports do so as the Wildcats. When the school opened, it had just one student and a single typewriter and was meant to operate as a business school. Some of the earliest classes offered at the school were on topics like English, bookkeeping, shorthand, and typing. The school was open to men and women. Regional accreditation for Johnson and Wales University comes from the New England Association of Schools & Colleges and its Commission on Institutions of Higher Education. Similarly, the Miami, Denver, and Charlotte campuses are accredited by their respective state boards and accrediting agencies. For example, the Denver campus is authorized to operate by the Colorado Commission on Higher Education. Some of the programs at Johnson and Wales University have programmatic accreditation. The didactic program in dietetics is accredited by the Academy of Nutrition and Dietetics, Accreditation Council for Education in Nutrition and Dietetics. The academy is recognized by the Council for Higher Education Accreditation. 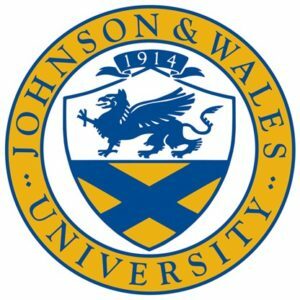 Students can apply online or via traditional mail to Johnson and Wales University, but the university recommends that students apply online for faster results. Each campus has a separate admissions team that a student can directly apply to when he or she sends in an application. The university offers early action admission for first-year students, as well as rolling admissions for all other applications. Most programs require a minimum of a bachelor’s degree, but some bachelor’s degree programs require that the student already has an associate’s degree when they enroll. Some programs are offered only at certain campuses, so students should check to see whether their chosen program is offered at the campus where they want to attend classes. Johnson and Wales University is a private university and charges the same tuition for all students whether they are a resident of Rhode Island or are from another state or country. Students who want to enroll in undergraduate classes will pay $33,054 per academic year. New students will also pay a $350 fee their first year. Students must also pay for a health insurance plan if they’re not already covered. Students can also choose to live on campus for a total of $7,872 to $13,761 per year and choose a meal plan that ranges from $2,316 to $3,474 per year. Those who enroll in graduate study will pay a per-credit-hour rate that is based on the program the student enters. The MBA program is $763 per credit hour, and the MAT/MED program is $356 per credit hour. Students must submit their FAFSA form if they want to qualify for federal student aid and other aid opportunities offered by Johnson and Wales University. Students who are offered loans may receive a combination of subsidized and unsubsidized loans, as well as Federal Direct Parent PLUS loans. Some students may qualify for tuition reimbursement or may want to apply for private student loans. Grant money may also be available through the federal Pell Grant program for low-income students. The program helps students obtain jobs on campus while they attend classes. There are also institutional and private scholarships a student may qualify for when they attend Johnson and Wales University that include the Campus Award and the International Presidential Scholarship.